There is much home-grown fantastic talent on the Island. Chemainus now has musical entertainment on the outdoor bandshell throughout the summer season. There are live musicals performed at the Chemainus Theatre, and the Ladysmith Little Theatre, and smaller groups and performers in local cafés. Check the entertainment and event calendar for the lastest in musical offerings in the area. 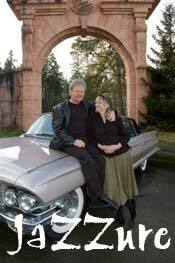 Larry and Virginia Blatchford have been making beautiful music together for 30 years. Their vocals will weave a rich textured tapestry of sound that shows true love. They have entertained at hundreds of venues across British Columbia and Alberta, Ontario and most recently at the Grand Palace hotel in Spain. Best loved songs are beautifuuly arranged in Motown, Rhythm and Blues, and light jazz stylings. Occasionally, Virginia will include her famous harp - Harriet in some of the music adding an interesting element to the modern technology keyboard.